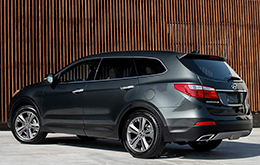 The reliable Hyundai Santa Fe is designed for buyers with families and features three different seating configurations, five, six or seven passengers, to accommodate a range of occupants. Rolling into 2014, the class-leading SUV remains primarily unchanged, however, there are a few new safety components and package upgrades that have joined the features list for the new year. Aside from the enhancements, the Santa Fe also comes outfitted with a powerful V-6 engine, which produces quick acceleration. 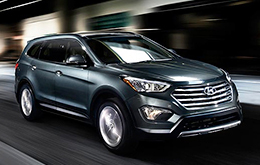 Continue reading below to learn more about the 2014 Hyundai Santa Fe in Arlington; then scroll down for additional information on its specs and exclusive photos. In an effort to keep the Hyundai Santa Fe on par with today's highly-equipped vehicles, the SUV has received a series of updates to its available packages. Each technology package offered throughout the Santa Fe lineup is now available with ventilated front seats, memory seats and a rear parking assistance system. The Santa Fe Sport 2.0T and Santa Fe Limited technology packages also offer HID headlights and LED taillights, increasing nighttime visibility. In addition to these enhancements, blind spot detection, designed to alert drivers of obstructions within their blind spot, is now available on all models and the Santa Fe Sport Premium Package gains rear side window shades. Outputting 290 horsepower and 252 lb.-ft. of torque, the 2014 Santa Fe's 3.3L V-6 engine is powerful and fast. 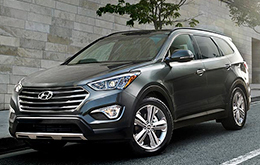 It's available in front-wheel and all-wheel-drive, and is matched with a six-speed automatic transmission - mentioned in many 2014 Hyundai Santa Fe reviews. It also has the ability to accelerate from zero to 60 mph in 7.7 seconds, making it one of the quickest vehicles in its class. Additionally, the Santa Fe can tow up to 5,000 pounds, including boats and trailers - a plus for active families. In a variety key areas, the 2014 Santa Fe out does segment competitors like the 2014 Toyota RAV4, Chevy Equinox, Honda CR-V, Ford Explorer and the Kia Sorento. The Santa Fe's got several noteworthy characteristics, including its advanced incar technologies and exquisite exterior design. Compare its price against the competition and you'll definitely see that it's a fabulous value, which makes it a top choice for many Arlington Hyundai customers. Glance over our Santa Fe Facts list; look just below this text for bullets. 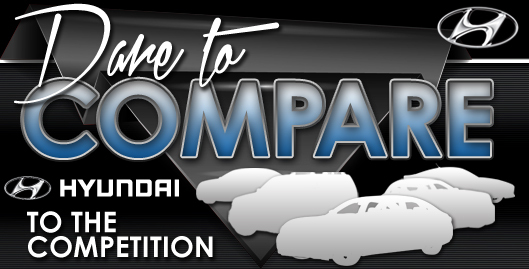 Thank you for reading Vandergriff Hyundai's 2014 Santa Fe review! We are a respected Hyundai dealer in Arlington, and it's our responsibility to supply you with reviews recorded by some of the finest automotive writers in the industry. Each overview is brimming with valuable data, including info about mpg and more - everything you need to make an sound purchasing decision. Now that you've read Vandergriff Hyundai's review of the 2014 Santa Fe, please reach out to us to find out about deals from the OEM and exclusive offers, so you can lower the price on your next purchase!